A LOCAL primary school is giving new life to old materials, repurposing “junk” and saving it from landfill. “Loose parts play” has been a part of lunchtimes for Hammond Park Primary School students in Years 1 and 2 since last term. Old tyres, chairs, pots, pans and the like were collected, cleaned and donated to the school by staff at the Henderson Recovery Park, saving it from landfill. 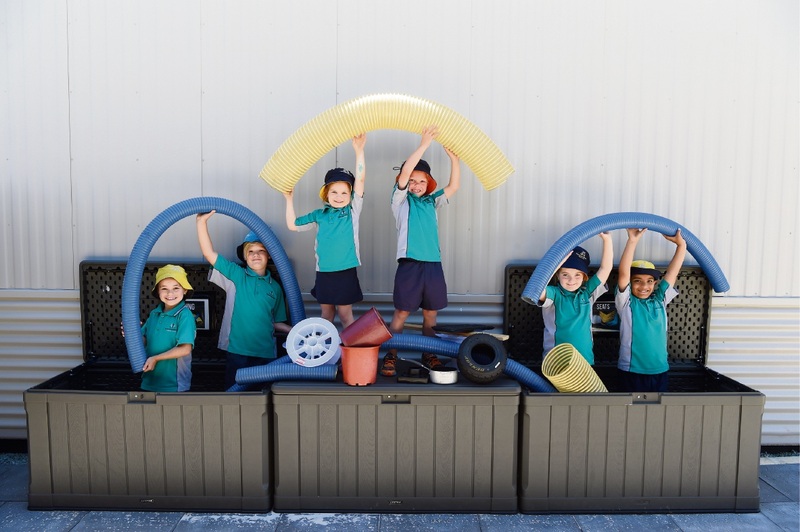 Teacher Debra Beesley said the recycled material offered students the chance to mould equipment to suit their imaginations, construct games and build props. “Students work together to create things such as cars, stages, bands, cubbies, kitchens and obstacle courses,” she said. “They can play with one piece of equipment or manipulate a wide range of different pieces together to engineer an idea into reality. Ms Beesley said the program, which ties in with STEM learning, saw students return to class settled and focused. “Students are very excited about it and the way students work together has been better than we expected,” she said. A Waterwise grant allowed the school to buy storage boxes for the items. The grant also paid for professional learning with Anne Grace from Loose Parts in Carts.